Global share markets have fallen back amid investors' widening fears of a sustained worldwide economic recession. 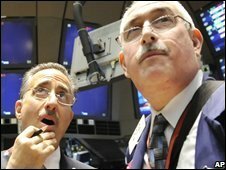 Wall Street tumbled sharply following similar falls across Europe and Asia, before clawing back some ground. The Dow Jones Industrial Average closed 3.6% down having gone more than 5% lower in early trading while the Nasdaq index finished 3.2% down. On European markets, London closed 5% lower, Frankfurt slid more than 5% and Paris was down more than 3.5%. Investors have been dumping shares worldwide because of gloomy prospects for the global economy - and are looking at other forms of investment. In Moscow, share trading was suspended on both main share indexes until 28 October, after they plunged more than 10%. Global money markets have showed renewed signs of stress, despite the billions of dollars that central banks and governments have pumped into the markets in recent weeks. Investors worldwide are worried about falling share prices and the possibility of companies defaulting on their debts. As a result, they have been selling shares in markets across the globe and switching to less risky forms of investments, such as government securities. On Friday, the yield on US Treasury bills fell - a sign that demand for them is high and investors are willing to earn lower returns in exchange for a safe investment. However, there was one glimmer of hope and a sign that banks may be more willing to lend to each other. Three-month lending rates among banks in the US and Europe dipped slightly. The rate for lending dollars over a three month period eased to 3.52%, though the fall was very slight - just 0.02%. The rates have fallen steadily for 10 days, as confidence in the banking sector has been helped somewhat by all the rescue measures announced by governments. "Investors are now trying to ascertain how deep the global recession will be and the impact on future growth," said Chris Jarvis, at Caprock Risk Management, New Hampshire. The dollar and yen both rose sharply against most other major currencies, kindling speculation that central banks might be forced to intervene to rein in volatile moves. "You are seeing the currencies move as they would in any sort of full-fledged panic," said Firas Askari, at BMO Capital Markets in Toronto. "I think we have to be close to the end of this awful cycle. It's usually darkest at the bottom," he said.